Physical exercise is beneficial for every body, to maintain fitness levels or to improve a little or a lot. 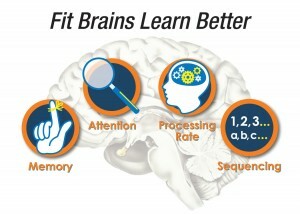 Brain fitness programs strengthen weak areas in the brain, much like physiotherapy or a personal trainer help strengthen and improve your physical body. Most of the following brain fitness programs can be done by adults and children, or have versions that are suitable to different age groups. Most of the programs can be done either in our centre or in your home. These programs are suitable for anyone who wants to improve their brain. Fast ForWord – Our most popular programs. These game-like computer programs were developed by neuroscientists and are suitable for children (Grades K-12) and adults. The success of over 2 MILLION products have been measured in over 250 studies. These programs improve reading, math, learning, attention, memory, thinking, and so much more! They can be done in our Langley computer lab or in your home. Reading Instruction (combined with spelling and printing/handwriting) – We use reading methods that are proven to be the very best methods for even those kids with severe reading struggles like dyslexia and reading disorders. Usually we combine them with one of our other programs in order to get bigger, faster results. Our reading instruction methods come by a number of names including synthetic (to blend) phonics, explicit (clearly taught) phonics, systematic (in a precise order) phonics, and linguistic reading. Interactive Metronome and IM-Home – Children, teens, adults and athletes can benefit from this intensive attention training. It can be done in our office or your home. PACE (Processing And Cognitive Enhancement) – Age 8 to adult. This is a fantastic program for improving learning and attention abilities. Master the Code – This linguistic (also known as explicit, systematic, or synthetic phonics) reading program partners with PACE. Linguistic reading programs have been proven successful where whole language, analytic phonics, and balanced reading methods have failed. The Listening Program, TLP Spectrum, and TLP Achieve – Listening therapy that provides engaging brain stimulation to improve performance in school, work and life. In the comfort of your home, the participant does one or two 15-minute sessions per day. Suitable for ages 2 to 102. Samonas Auditory Intervention – Suitable for children and adults who need a gentle approach to auditory training but may have bigger issues like anxiety, OCD, ODD, etc. We offer it as a two-week intensive to get big results quickly.